Are you looking for a Confidentiality Agreement? Download our Confidential Disclosure Agreement Template now! 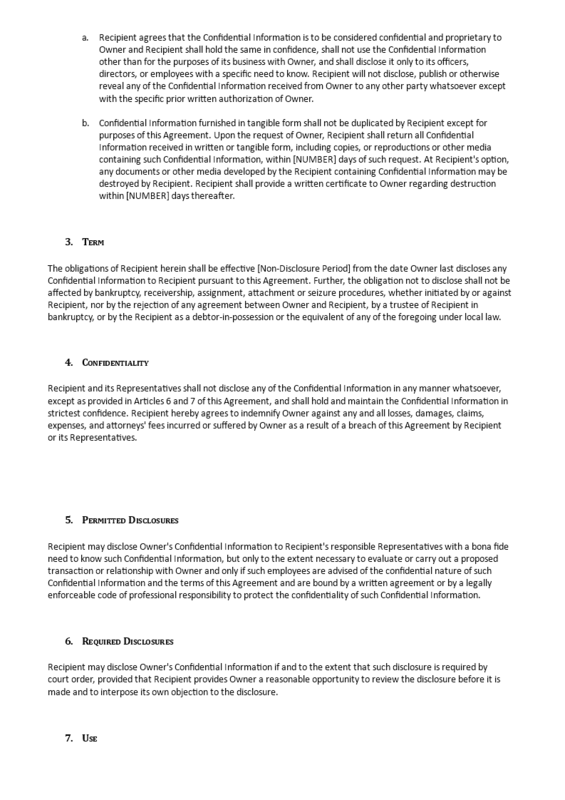 We provide a 6 pages counting professional Download Confidential Disclosure Agreement Template which can be signed between at least two Parties to agree that one Party (one-sided CDA) or both Parties (mutual CDA) will keep the nonpublic business information, material, knowledge, etc that is shared confidentially. By signing this, they agree not to disclose information covered by the agreement. Other common names for a CA/CDA are: Proprietary information agreement (PIA), Non-Disclosure Agreement (NDA) or secrecy agreement. Our legal templates are all screened by Legal professionals. Download this CA Template if you want to save time, costs and efforts!